After we hosted a fabulous Active Retreat in November and December 2018, we are delighted to offer you the chance to book your Fuerteventura fitness holiday 2019 with us! Building on a fantastic week, our fitness holidays in 2019 will be better, bolder, more exciting and increasingly adventurous! They say fortune favours the brave and in this case, it was right. We challenged ourselves to deliver the best value health and fitness retreat on the market and we delivered. Here’s a review of the Active Retreat 2018 – the best value fitness holiday in Fuerteventura! We partnered with new organisations, we took our guests on new routes for the cycle ride, we changed our food offering, we trialled a new villa and yoga practice space, dropped activities we didn’t feel contributed much to the overall guest experience and finally, added a social BBQ to the week. Here’s how the Active Retreat 2018 went down…. This time we tried a new approach with our yoga. We worked with one teacher for all of our classes. This allowed both the group and the teacher to become familiar with one another, so the relationship and teaching style grew together, rather than us having to start from scratch each time. The yoga yurt is purpose-built and is insulated with wool – this means much of the exterior noise and interior sound vibration is stopped, allowing for a really tranquil and calm environment. Perfect for restorative yoga practice. We enjoyed restorative yoga sessions to assist our recovery from the higher-intensity elements of the fitness holiday. It worked perfectly – despite training daily, nobody suffered any real stiffness throughout the week! One of the guest highlights of the Active Retreat is the bike ride. This is our big cardio offering of the holiday. This year I wanted to push our guests further, so we increased the distance of the ride from 27km to 43km! It was a bold move, but I was confident we could do it! The north shore is a flat dirt track that covers around 20km, so we ride back along it at a decent pace, taking advantage of the lack of hills to cover the miles quickly. We arrive back at El Cotillo for some refreshment ahead of an evening yoga class. Not a bad way to end a 43km ride in the sunshine! On the Active Retreat water sports are a key part of our offering. How can you be surrounded by the stunning Atlantic Ocean and not use it as part of your holiday? We offer a Fuerteventura fitness holiday and water sports are a key part of health and fitness on the island. We partner with approved surf schools and surf centres, who provide high quality surf instruction, full equipment and full licences. We only use the very best local surf schools who can take our guests to the most appropriate surf school spots on the island. One of the toughest workouts of the week are the dune sprints. It’s a very simple workout, but a very, very tough one. We have nicknamed one of the dunes ‘The Dune of Doom’. It’s around 40m high and a steep angle. It’s a real calorie burner and shows our Active retreat guests how simple a really, really effective workout can be. On our Fuerteventura fitness holiday, we use nature as our gym where possible. In a beautiful environment with incredible weather, why train inside?! Let’s get outside and enjoy exercise in the fresh air! Fuerteventura Fitness Holiday – the Social Side! It’s really important to us that our guests enjoy a social holiday as well. Yes, they’re there to train, but they’re also on holiday. We don’t lose sight of that, so it’s a key part of the holiday that everyone enjoys themselves! Our guests are training hard, so they can enjoy the rewards too! We enjoy a couple of nights out, a BBQ and a couple of local restaurant meals. With so many like-minded people on holiday together, we always have a great time and make friends for life…. It’s such a cliche, but it’s also true. Every Active Retreat brings a new set of guests who are looking for a great holiday. For the most part (returning guests aside) they are brand new visitors, but at the end of our week together, we’ve all made friendships that last. When you get a group of like-minded people together in a fantastic environment, good things always happen! 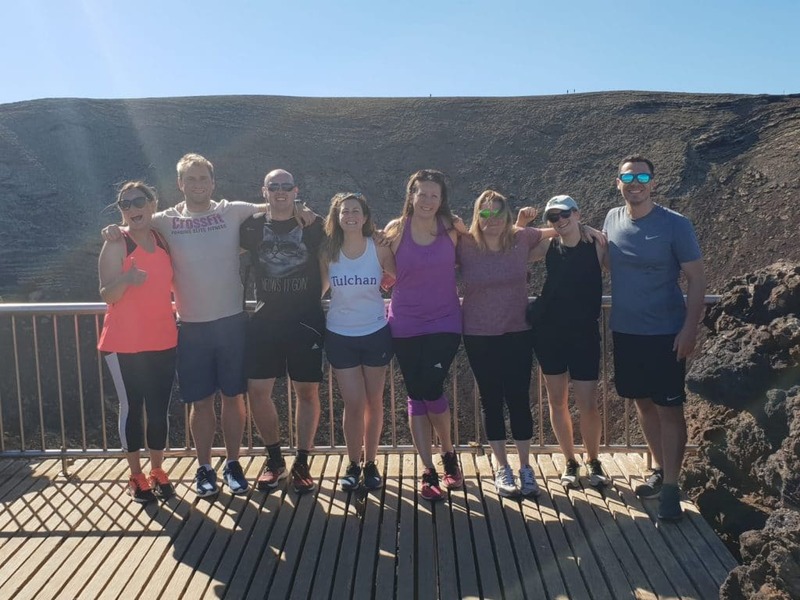 If you’ve been looking for a new type of holiday and a Fuerteventura fitness holiday sounds like your kind of thing, we’d love to welcome you along on the next Active Retreats! You can find more information on the kinds of questions people ask us here. If you’d like more info, email us on enquiries@theactiveretreat.net and we can tell you everything you need to know!